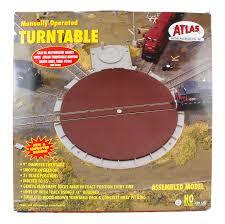 eatures Simulated wood brown turntable deck and concrete pit ring. Surface mount; no cutting necessary. Manual crank operation; can be easily motorized for remote control operation with the #304 Turntable Motor Drive Unit.